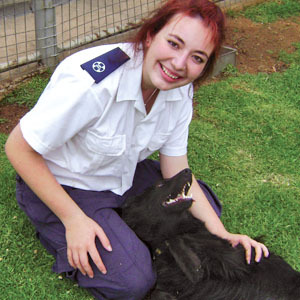 An SPCA inspector’s primary role is to respond to complaints about the ill-treatment or neglect of a range of animals in the community. A significant part of an inspector’s duties is education. Often, animals are unintentionally neglected and those responsible are genuinely upset by the incident. There may be calls to emergency situations where animals require immediate assistance or rescue. Some instances may necessitate court action, so the inspector is required to gather evidence and prepare a prosecution file. giving talks and presentations to educate the public about animal care and protection. Why did you choose this profession? I joined the SPCA because I wanted to protect animals. What training did you do? I had to work at the SPCA for three months. After that I wrote an exam and, after passing, I had to attend a two-week training course. I then had to write a second exam and complete a project. On completion, I underwent training in becoming an animal welfare assistant (AWA). This involved learning about vaccinating, deworming and euthanising animals. Only after successfully completing all of the above do you become an SPCA inspector. What traits does a person require to do this work? You have to be a really strong person. You need to get along with people under difficult conditions and be able to educate them. Is experience as important as formal training? Yes. Having experience working with animals will help you to better utilise your formal training. Describe a typical day Attending to complaints, doing pre-home and post-home inspections; doing pet shop inspections; educating people; prosecuting people; having people get upset with you. What do you like the most about your work? Being able to spend my day working with animals, as well as looking after them. What aspects are you least keen on? The fact that I have to humanely euthanise animals. What’s been the highlight of your career to date? Every day is a highlight. Being able to protect animals means an awful lot to me. Name one of your future goals To become a senior inspector. What advice would you give to someone starting out? You have to be patient with the animals’ owners. When you get upset, you cannot show it. You need to understand animals and their needs. You really have to work hard. This is a 24-hour job and not everybody is cut out for this kind of work. You have to be really committed. Describe your job in three words I am PASSIONATE about it, I LOVE it… and it’s HARD. Candidates need to be employed by an SPCA, where they must serve a probationary period either as a volunteer or paid member of staff. The person can then be booked in to write an entrance exam, which is the qualification needed in order to do the Inspectors Training Course. This course involves lectures and practical training, at the end of which another examination is written. The final level in becoming an inspector is to complete a written assignment on a specified topic. The trainee is also required to qualify as an animal welfare assistant, which legally enables the person to perform certain basic functions in terms of the South African Veterinary Council Requirements.